I wrote this post in 2012 and it did not get read back then. I think my readers now will appreciate a glimpse into life in a very small town. It is a response to an article Dave Berry wrote for the New York Times. Even after all this time, this is one of my favorite. Here is the comment I made in the Times all those years ago. Remember it was an election year so everyone was seeing ghosts of things past and what it all might mean in the future. Small town America simply refuses to die. It could be that it will take the death of the last of "breakfast club members" sitting in a small diner to end that rural community era. In the meantime, retirees like me will continue to dance to Roy Orbison in the middle of main street and not fear for our lives. It is what it is! Oct. 18, 2012 at 5:34 a.m.
Dan Berry used to write a column at the New York Times called This Land. It was about the unremarkable corners of small and large towns. He looked at more than just the news...he talked about the people. Back in 2012 he wrote about Elyria, OHIO and the owner of a small diner in an article called "With a New Menu and a Makeover, a Promise to Keep Going". 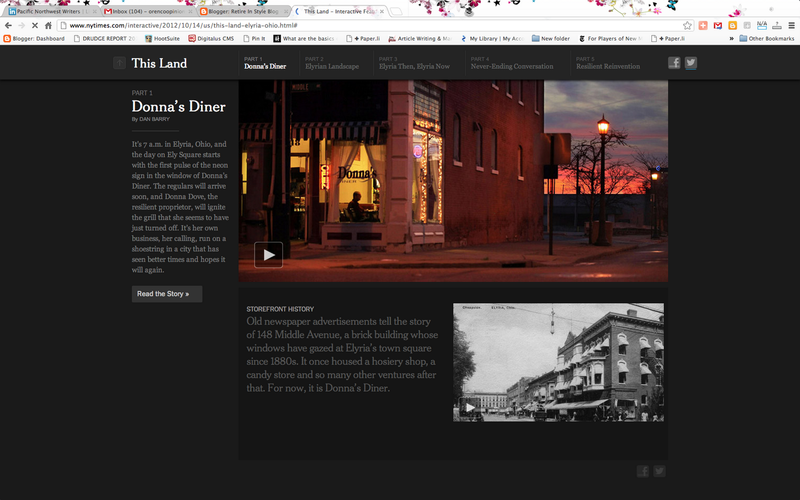 There was and maybe still is a small restaurant on a Middle Avenue in Elyria called Donna's Dinner. I've never been in Ohio but Donna's sounded just like the Main Street diner in every small town I have ever known. A place like that was where I stopped after school to have a coke with lemon or a maraschino cherry. That was over 50 years ago. Little restaurants in my home town have been closing and reopening over and over again since that time. Any given day could the the last day the restaurants will be able to stay open. One mistake and they are gone. Life on Main Street in small town America never changes. Even in a very small town there are those people that see themselves as important and like to call the shoots while staying our of the line of fire. That is the Main Street I worked and lived near. They gave unsolicited advice and made decisions that were not their's to make. In those places the "movers and shaker" met in their diner over coffee or pie both in the morning or afternoon. They call themselves "the breakfast club" in a lot of places. Politics and the high school football teams might be discussed. This is where coaches are fired, teachers gossiped about, and mayors demoted to figure heads. Communities are shaped in places like Donna's without the town ever realizing what is happening. The "breakfast club" always meets in a quiet back corner booth. Times will change but as long as small towns breed those that will participate in "breakfast clubs" the diners will be around. Only when the last of the morning breakfast club dies and people quit playing western music will that era be gone. It may be next week or it may be never. Who knows? The characters in the story by Berry written back in 2012 could have been my neighbors or gone to school in my husband's high school. The Grandmother's that were pregnant in their teens have grandchildren that are pregnant teens. High school ball players are still living off their high school glory, some burned out by drugs or damaged in some other ways. The banker, lawyers and judges don't stand on ceremony...people mix in the red vinyle clad booths. The only hope for these place with high unemployment is the community college or the satellite campus from a distant University. I am talking about Eastern Oregon but the New York Times was talking about Elyria, Ohio. It really doesn't make any difference. It is all the same. In the end though, people like you and me, seasoned and experience, know that change is always happening. If we are smart, we will adapt and find a newer version of our home town just so we can feel at home. Lots of us will cling to the important things like good books and friendship and tolerance. We will promote education and dream that technology will only get better. But all that is good and bad in small town American will keep on going...day after day. Don't we all...melt back in the streets of our hometowns? So here's to old cars and to dancing on Main Street to Roy Orbison until the end of time! And we should all wish Donna and her diner the best of luck. She is going to need it. Being a small town girl born and raised, I have a certain jaundiced view of the experience. It is kind of sad really because people that have not lived the life see it idyllic. Sort of a Opie and Sheriff Taylor kind of place. Maybe my home town was unique but I doubt it. I did have a perfect childhood. My parents were good upright people and I was raised to a very high standard. It is hard to explain but even my class mates saw that in me...perfect curls and a bit prissy. But it has served me well. I was well educated and used my college degree to great advantage. But once a small town girl...and so it goes! Did not have small town experience until retirement - and love it! A small community can be a perfect retirement spot. It is affordable and generally friendly. That is good. I am glad that you have found something that is good for you. I, too, had a perfect childhood in a wonderful small town. I remember my best friend and I (age about 8) sitting on the porch saying "aren't we lucky that we live in the best country, in the best state, in the best town and on the best street in the whole world?" We felt it, and I think it was true.